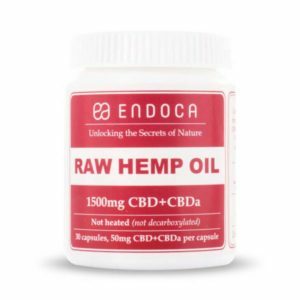 Endoca’s Raw CBD + CBDa Hemp Oil Capsules are packed in vegan gel caps and are gluten-free and kosher.The capsules are made from 100% plant based ingredients, no animal by-products, preservatives, artificial colors, starch, sugar, corn, dairy or wheat. Endoca uses the unfiltered first extract oil containing CBD which is very thick and waxy. Using CO2 from air you breath to extract all the beneficial molecules to produce a unique whole raw plant extract. In this raw oil no heat is ever used. The contents of the capsules is similar to eating the Hemp plant in its natural state. Everything that was there to begin with is still there. Perfect for someone on a raw food diet. Available in 300mg and 1500mg sizes. 10mg or 50mg CBD+CBDa per capsule.